Quality Product Design: Don’t Give Me What I Want… Solve My Problem. A. Product Designers and UX Pros think differently than other humans. B. Really skilled Product Designers and UX Pros see problems that need to be solved, not features that need to be added. Sometimes you come across companies who have a strong focus on integrating client feedback, but their products eventually implode and become so feature laden that they sink. There are ways to integrate feature requests and take a user centered approach without destroying your product. 1. Listen to feedback clients throw your way with an interpretive ear, and don’t be afraid to dig deeper to identify underlying problems. Listen beyond the words your clients are saying and the features they’re requesting, and get to the root of the problems they are trying to solve. 2. Sometimes feature requests are actually usability issues in disguise. We’ve had several situations where a client requested a new feature, and after some digging and discussion we discovered that an area of our product would solve the problem with some minor tweaking. There was just a usability stumbling block getting in their way. 3. Sometimes the product features clients request are actually new product offerings in disguise. “I wish the product would do this. If you’d add these features, I could use this to do Y.” All client feedback doesn’t have to be fed into a primary product, when the problems that need to be solved could be handled with a separate product with a laser focus. Bloating your flagship product with a million features will lead to client frustration. Creating a new product that solves a client problem with ease = gold. 4. 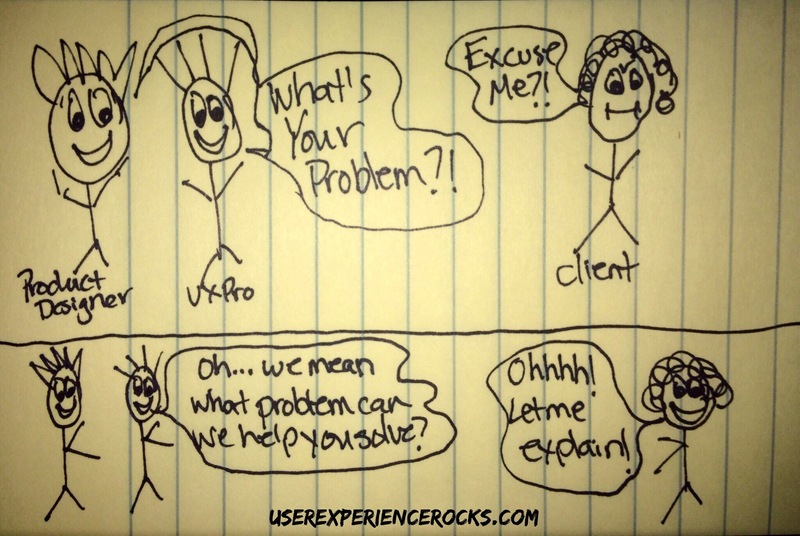 Focus your energy on hearing the users’ needs not the users’ wants. 5. More features do not equal a better product. Products in their purest, simplest form, are a thing of beauty. Any designer in the world can create a product and snap a million features on top of it, and around it and under it. It takes a skilled product designer & UX pro team to pare down a product to its simplest form, until it’s a clean, elegant, easy to use solution. So basically what I’m saying is, listen to your clients. Respond to your client needs. But don’t just give them what they ask for… solve their problems.